Migrating seabirds heading east up the channel may include Pomarine and Arctic Skuas, Black Terns, Little Gulls and Manx Shearwaters. Bottle-nosed Dolphins might still be around (please report any sightings to the Rangers). 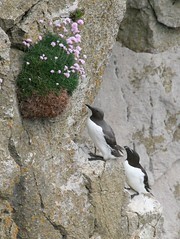 On the cliffs, Guillemots, Razorbills and Fulmars are sitting on eggs but Shag chicks should have hatched. Swifts also nest in the cliffs, and look out for Black Redstarts. Migrating birds of prey such as Hobbies and Harriers are sometimes seen. Specialised, salt-resistant wildflowers like Thrift and Sea Campion form a colourful carpet on the clifftops and may be visited by migrant butterflies like the Painted Lady. A fine array of downland flowers include the bright blue Chalk Milkwort and the yellow Horseshoe Vetch. 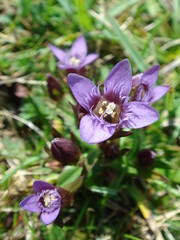 The rare Early English Gentian may also be found growing in the short turf. 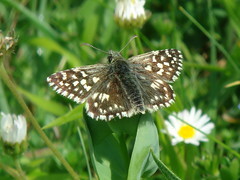 More and more butterflies are emerging with Grizzled and Dingy Skipper, Small Heath and Wall particularly noteworthy. Adonis Blues should also appear before the end of the month. Migrant birds encountered could include Whinchats,Whitethroats and Turtle Doves, while residents like the Stonechat will have produced a first brood of chicks. 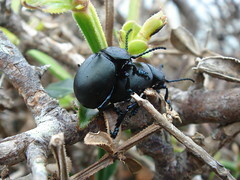 As the days get warmer, Slow Worms and Common Lizards become more active, Bloody-nosed Beetles and newly hatched Grasshopper and Bush-cricket nymphs abound. Plenty of birdsong to enjoy especially: Yellowhammers, Linnets and Skylarks. In the meadows Cowslips, Hayrattle, Common Vetch and Ox-eye Daisies provide a colourful spectacle. 6-spot Burnet caterpillars may be found on Birdsfoot Trefoil flowers, while the adult Mother Shipton and Cinnibar moths are already on the wing. Keen eyes may find brilliant blue Emperor Dragonflies hawk for smaller insects, often a long way from water. A Stoat may be glimpsed stalking Rabbits. Most woodland birds are busy feeding young and may become rather secretive. Late-nesting, Sparrowhawks may be seen displaying overhead. Spotted Flycatchers, one of the last migrants to arrive, are a regular sight, making repeated sallies from the same perch. Viewpoints across Durlston Bay should yield views of fishing Sandwich Terns while Swallows, Swifts and Martins hawk insects above the landslip. Warm glades are home to Speckled Woods, Orange Tips and Green-veined Whites while Common Blues are frequent in the meadow. Adders-tongue Fern can also be found in the same area.